The Third International TOS Conference 2013 held July 23-27 in Wheaton, IL was a roaring success!!! 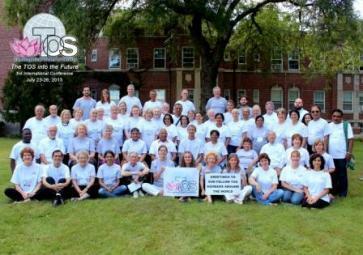 Participants from over 13 countries and six continents came together for five days of sharing, laughing, meditation, brainstorming, playing, strategizing and planning for the next five years of Theosophical service worldwide. Presentations on the importance of service as a pillar of the spiritual life, tapping the potential of volunteers and balancing inner and outer action were coupled with a Tree Planting in honor of Colonel Olcott, a “Locks of Love” surprise donation by TOS-USA President Nancy Seacrest, an “Oh Hidden Life” group sing-along and of course lots of photos! Individual TOS groups presented the theosophical projects being carried out every day around the world “In Service of Those Who Suffer.” And of course, sprinkled throughout the whole week were the occasional zany antics to reinforce the important idea that service should be taken very seriously – ourselves however, not so much! To view a video of the inspiring projects undertaken by TOS-USA on behalf of children, click here: http://youtu.be/XBDf6RPh284.